DIYers like Bonnie Grant see the potential of wooden pallets, unlike some of us who may deem wooden pallets ugly and useless outside of the warehouse. 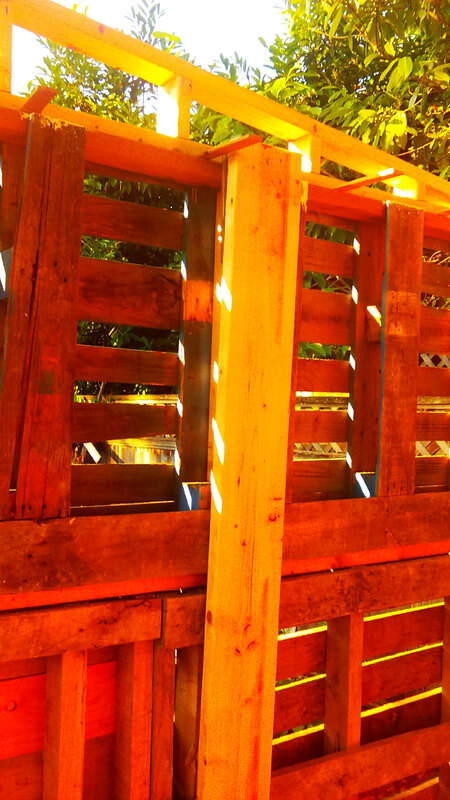 Bonnie has proven these people wrong and transformed a pile of wooden pallets into something tremendous! 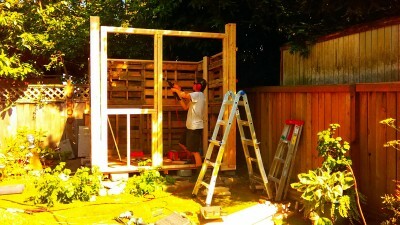 In this third installment of “The Wonderful World of Pallets: Building a Pallet Studio”, Bonnie Grant instructs us on the process of putting up walls! The walls are the next portion of the building process. These will set the tone for the entire remainder of construction and dictate the strength of the building. We used 12 pallets for the side and back walls. Because our side walls are only 8 feet, we had to cut 4 of the pallets for the side walls to fit the area we had for the building. If you have a larger footprint, you may not have to resort to this extra step. Set the lowest pallets first. The walls are constructed of 4 pallets with 2 on the bottom and 2 mounted on top of these. The back wall is easiest but will take a couple of extra hands to hold them in place and join them. Screw these together at the seam and then mount them to the ply/pallet sub-floor with 3-inch screws drilled in at an angle. You can also use metal joining plates if you wish for extra sturdiness. The side walls are joined to the edges of the back wall like interlaced fingers. You may have to set the walls up in a test formation to determine which pallets will fit into the edges of each other before you permanently join them. We alternated the cut side pallets with uncut ones for extra strength. Once you have joined the first of the side wall pallets to the edges of the back wall pallets, add the final pallet to the wall for the 8-foot dimension. Don’t be alarmed that the walls may be a bit wobbly. Once you get the entire frame and roof on, the structure will be secure. Repeat the process for the upper portions of the walls. Alternate placement of the pallets you will have to cut to achieve the dimension of the walls. Make the edges as plumb as possible to facilitate easy installation of the siding and the remainder of the framing. Once you have walls in place, you will want to make the walls a bit more sturdy and even. We chose to use some 2 x 6 wood on the interior side walls as a temporary brace. Nail or screw these into the walls as added props during the remainder of construction. They will be removed once the roof has been constructed. An additional brace over the front opening to the side walls will also help shore up the building. The door and any windows should be found or purchased before you begin framing the front in order to ensure the correct sized openings. Our frame is constructed of 6 (2 x 4) boards. The first 4 boards form a square that fits the open front with an additional 2 boards at each side for added strength. Next, measure once and then again to get the dimensions of your door. Our door is an old monstrosity that came with a jam already built around it. Consider the additional measurements of the jam when you measure the door if yours doesn’t come already outfitted. Between our door and window are two more 2 x 4s, vertically installed and screwed into the upper and lower boards that form the square. We framed the window with double boards horizontally at the base and a vertical cut strut underneath that. Initially, I purchased cement board siding for its durability. It cost a pretty penny and, in the end, we took it back due to concerns that it would be too heavy for the structure. We settled on ½-inch plywood, which we primed on both sides to seal. This was installed at the bottom first, with the second pieces on top. The seams need to be caulked to prevent any water from entering the sub-structure. Seal in between the boards and at the edges of the building. The siding was done on the front of the building later, after the door and window were installed. You can choose from a number of siding options, from sheets of composite to shingling. We went for this option because it was simple, cost effective and once primed with two coats of heavy duty exterior paint, the effect will be sufficient and long lasting. Some cutting is required for the side exterior walls. You can install the ply first, as it is, and use a sawzall to trim the excess or measure each piece and cut before installation. Just be careful with cuts and measurements, as too much removed will create huge gaps at the corners where you want flush cuts (to prevent weather from entering and damaging the wood). I'm going to build a bike shed and workshop.